Sector Earnings Update: Can Telco Sustain the Upside Momentum ? I wanted to post this data just to show how sector earnings data can be useful. from Thomson and Factset, and how forward estimates can be impacted by M&A. Q4 ’15 was the strongest quarter of Telco earnings growth in years, per FCSP500EPSrevgro(qtrly), and much of it had to do with AT&T’s acquisition of DirecTV. Prior to T closing the DirecTV acquisition, T was expecting 1% revenue growth in 2015, but after the Q3 ’15 closing, expected T revenue growth for 2015 shot up to +12% and also finished the year at +12. Note how revenue and EPS growth accelerated for Telco through 2015 (second spreadsheet), and then look at the first link again and see what 2016 holds for the sector. The fascinating thing to me is that there are just 5 companies left in the Telco sector per the Thomson Reuters data, and the two 800 lb gorilla’s are T and VZ. Why doesn’t Standard & Poors simply roll up the Telco sector into the Technology sector as Transports were done with Industrial’s year ago and leave it at that ? With Telco just 2% – 3% of the SP 500 by market cap, it is relatively insignificant to the index, although there are a lot of income investors and elderly piled into the stocks for the dividend no doubt. As a long-time fan of T, both as a customer and investor, I am watching the stock here, without any positions in either T or VZ. The ability for AT&T to drive free-cash-flow and “synergies” (i.e. expense savings) from the DirecTV merger is crucial. We’ll find out more in April ’16 on how T is doing integrating DirecTV. A trade through $38 – $39 on heavy volume and T makes sense as a capital appreciation play, as much as a dividend play. No question though, the earnings expectations for 2016 are subdued. 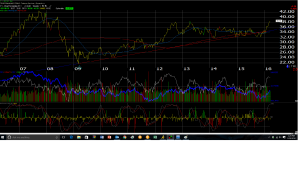 VZ is testing the 2013 near $53.81 and T is testing the 2012 and 2013 highs near $38.50 – $38.80. Both stocks are at the high end of multi-year trading ranges.